To understand the end product, we must start at the beginning. Diana and Jim have been married for many years with one daughter, Ashley. Jim was a Lineman in the Canadian Forces for 35 years while Diana tried her hand at many occupations, the Military reserve, secretary, hair stylist, and then decided to head back to University where she emerged with Computer Science and High School Teaching degrees. Diana continued to try different occupations and currently works with the Ontario Public Service. Jim, Diana and Ashley have always been animal lovers and in 2003 moved to a small farm where they have horses, dogs and cats. This is when the winter cooking Saturday routine started which eventually led to Polar Bear BBQ. Living on a farm in the winter promotes indoor activities because by the time you finish your chores outside, you do not want to play outside. So Jim and Diana started to cook on Saturdays. This quickly evolved to themed cooking sessions, and at times there was a little competition between Diana and Jim. The cooking competitions continued into the summer with barbeques. This is not to say they did not crank up the snow covered barbeque in the middle of winter…they are Canadian after all. During one of their winter cooking sessions in 2011, a particularly long session, Diana proposed opening a specialty food trailer. Jim quickly agreed as he had been thinking the same thing; remember they had been married a long time. That night Polar Bear BBQ was born and a 4 year plan developed. Diana and Jim have always been proud Canadians and own a number of animal breeds with Canadian decent. Canadian dog breeds included a Newfoundlander and a Nova Scotia Duck Toller Retriever plus two La Cheval horses which are Canada’s National Horse. It therefore made sense to them that their company reflects Canada. Jim and Diana, having spent 30 years being backyard barbequer, wanted a unique flavor and spent two plus years concentrating on developing their dry rub, barbeque sauce and a number of other recipes. Thanks to their wonderful friends, who were unsuspecting ginny pigs during dinner parties, their recipes were perfected. Not all of Diana and Jim’s attempts at smoking meat were successful and the initial attempts in their small Napoleon smoker ended up having to be completed in the oven. Luckily neither of them wanted to give up and they continued trying different methods until they succeeded. This was just the first of many hurtles that Jim and Diana would have to laugh at and continue on so that they could fulfil their dream of opening Polar Bear BBQ. In July 2013 the go/no go decision was made and the Polar Bear BBQ logo was commissioned to be created and the trailer was designed on paper. In October 2013, Jim retired from the Canadian Forces and focused his attention on Polar Bear BBQ. In December 2013 Polar Bear BBQ was incorporated and their daughter Ashley became a part owner. The final design was also finalized and French Fry Trailers started construction on what would become the most unique trailer they had built to date. Early in 2014, after numerous hours of research, the custom smoker was ordered from Missouri for the food trailer. Diana and Jim realized that working with a smoker of this size that they needed extra training. In their true fashion of not doing anything small, in March 2014 they headed to Houston Texas for a Pitmaster course by the only certified Pitmaster instructor and multiple Grand Champion Pitmaster winner, Konrad Haskins. 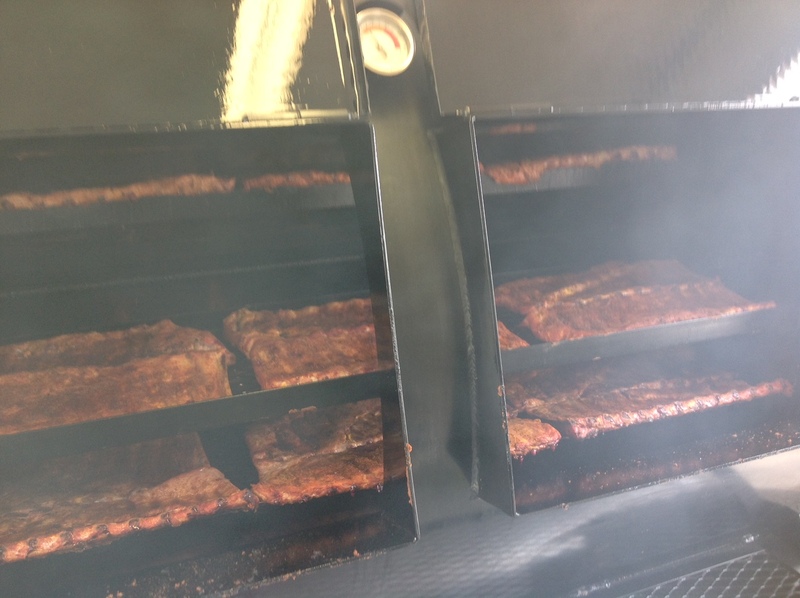 The next phase of the journey was to get the smoker into Canada and then into the trailer…sounds easy right…LOL! The smoker was transported from Missouri to Watertown in the back of a pickup truck where Diana and Jim with 6 friends were to meet it in a shopping mall parking lot to move it from the transport pickup truck to their pickup truck. In the words of the transport driver, that day was displaying a “Festival of Weather”, none of it nice. With a wind chill factor of -20 degrees Celsius the task began. It should be pointed out that the smoker FILLED the pickup truck, weighing 1200 pounds and was much bigger than it looked in pictures. After an hour of brute strength and ignorance the task was completed and it was time to head to Canada. It should be noted, that at this point the team had no idea of how they were going to get the smoker off the truck and into the food trailer. Everyone was secretly hoping to find some heavy equipment to aid in the smoker’s dismount. Quickly after arriving at French Fry Trailers it was evident that the smoker would fit in the allotted space but opening the door to the kitchen would be an issue. It was now time for creative thinking…put a sliding door to enter the kitchen, put the smoker in sideways, etc. Then a friend said how about putting the smoker on rails and sliding it out when the trailer is at its location. A quick call from French Fry Trailers to one of their contacts had a fabrication specialist on his way. As it was only -15 degrees now and we had to wait 10 minutes, it was time to have a beer. Only in Canada!! With the help of some large equipment and a rail system from England the smoker, known as the Arctic Wolf, was installed into the food trailer and Jim and Diana’s dream had come to life. Jim Fayle is a 35 year veteran of the Canadian Forces, he has been married to his lovely wife Diana for 31 years and also has a beautiful daughter Ashley. For years Jim has been the home cook and backyard barbeque’r. He decided to enhance these skills and attend two barbeque courses in the USA, a Pitmaster course in Houston, Texas and a restaurant and catering course Ponca, Oklahoma. Both courses were taught by multiple Grand Champion Pitmasters, who were more than happy to pass on their expertise in Southern Smoked Barbeque. In the 5 seasons Polar Bear BBQ’s been running he and his family have done a number of catering/wedding cooks as well as large events including Havelock Country Jamboree, Glengarry Highland Games, HaveRock Festival. He has also done numerous smaller events throughout the Thousand Island region. Jim would be more than happy to help you with your personal catering events or see you at one of the many festivals Polar Bear BBQ attends. Watch us on Facebook for our locations. Diana Fayle was born in Nanaimo BC and has been asked by a many people how she met her husband, Jim, who is from NB? Jim and Diana met in Germany many moons ago while Diana was a Reserve with the Canadian Forces. Starting their life together in Germany sparked their love of enjoying good food with each other and friends. This joy of eating and serving great food lead them to open Polar Bear BBQ. Diana has always enjoyed cooking and experimenting to create her own recipes. It therefore seemed natural to her that Polar Bear BBQ had a unique flavor. Diana and Jim spent years experimenting to create their signature flavor that is the combination of their dry rub, barbeque sauce and the wood they use to smoke their meat. Diana also attended two barbeque courses with her family in the Southern USA to perfect their smoking techniques and pick up tips and tricks from the Grand Champion Pitmasters. If you happen to visit Polar Bear BBQ you may find Diana at the window taking your order, or at the prep station putting your meal together. Be sure to say Hi and let her know how you liked your meal as the Polar Bear BBQ team is always trying to give you the best possible meal!! Ashley is the daughter of Jim and Diana who grew up in a family who loves to cook. In the first years of joining the work force Ashley work in a number of restaurants as the Prep-cook. She enjoyed the experience and decided to attend St Lawrence College for a year of culinary arts. Ashley went on to work outside the food service business for a few years to see if there was another job which gave her more time to spend with family and friends. Still craving the excitement of working in food industry she was very excited when her parents asked her to be the Kitchen Manager of Polar Bear BBQ. She attend a Bar-B-Q restaurant and catering course in Ponca Oklahoma with her parents where she excelled in every aspect of the course. Ashley designed a Conveyor Belt system which allows the food at Polar Bear BBQ to flow out to our customers with speed yet keeping the high quality of our food. Ashley runs a tight shift keeping everyone in tune, one of her sayings is “if your not cooking your cleaning”. She hopes to see you at our events over the summer and looks forward to serving you some of the best BBQ in the 1000 Island region. Follow us on Facebook to see where we will be next. Want to know more about Polar Bear BBQ?